Get ready to catch Disney On Ice: 100 Years of Magic live as they come to Giant Center on Thursday 4th April 2019 for one unforgettable night! It's going to be an unmissable event so be sure to book your tickets in advance and get on down for an evening you won't want to miss! 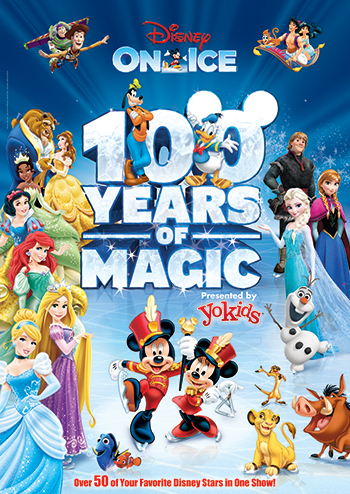 Be sure to share this epic Disney On Ice: 100 Years of Magic event with your friends and family! The top-of-mind venue for anything that showcases entertainment is Giant Center . Folks from all over Pennsylvania go all the way to Hershey to catch the latest and the best Concert event in town. One highly anticipated event is Disney On Ice: 100 Years of Magic. On Thursday 4th April 2019, doors of the Giant Center will swing wide open to welcome audiences from various parts of Pennsylvania who are raring to catch Disney On Ice: 100 Years of Magic on the live stage. With rave reviews all over, it will surely break box office records once again. Expect tickets to be in high demand and seats to be taken swiftly. Get your tickets now!